How to train Dogs and Cats to live together? The perception that dogs and cats don’t get along well isn’t always true. 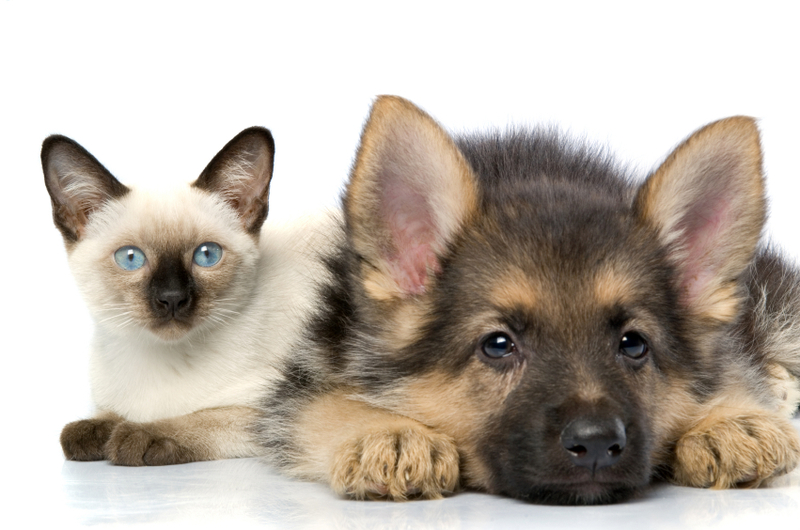 It is possible for canines and felines to live together peacefully under one roof. But, rather than being impulsive about the decision of bringing home a new pet cat, it’s important to give this idea some thought. Here are few tips to help you decide whether or not you should bring home a new cat and how you can train your canine and feline companions to live together harmoniously. Dogs when they are exposed to cats, during their early years of growing up, are more likely to be comfortable in the company of a cat in their adult life. So, if you don’t have any pets already but plan to bring home a dog and a cat, it’s always better to adopt them together, when they are still young. Growing up together they will develop a bond and be more comfortable in each other’s presence. Does your dog act aggressive towards other animals? If your dog picks up fight with other animals or has injured a smaller animal in the past, then getting home a cat is perhaps not the best option for you. If you don’t have a dog already and have plans of adopting both cats and dogs, then it’s better to go for a cat-friendly and less aggressive breed. This post by Animal Planet about the Top 10 Cat-friendly Dog Breeds. can help you decide the breed that you can go for. If you have a cat-friendly pooch, then it’s time to search for a perfect feline companion. Like dogs, cats that have been exposed to dogs, when they are 1-2 months old and in the early socialization phase are more likely to fit into a household with dogs. Whether you are getting a kitten or an older cat, look for dog-friendly traits. The cat should remain calm and confident around dogs, and not run away out of fear and encourage a chase. Introducing dogs and cats takes time. So, it’s important to be patient, and not force the two to be together. Do not ignore your existing pet while your try to accommodate the new one into your life. Here are few things that you can do to ensure that the introduction process goes smoothly. Set up a dog-free zone for your kitty, preferably a room with a small door or gate that your dog cannot enter. Place the food and water bowls, the litter box and your cat’s bed and toys in this room. Your cat is less likely to feel stressed and scared if she has a secure place that she can retreat to away from the dog’s reach. Let the two animals meet each other for brief periods initially and gradually increase the exposure, For instance, you can keep the cat confined to a room with a closed door and let your dog get used to the scent of the cat. When they are settled with that, you can allow the two to see each other through a barrier. Then, allow them to meet each other in a neutral room, keeping your dog on leash and keeping your cat away from the dog’s biting range. Keep repeating this for several days or weeks, until the two get comfortable being in the room together. Dogs and cats are different each with their own personality quirks, likes and dislikes. By giving them personal space and by creating a comfortable and friendly environment where they feel loved and taken care of, you can help nurture a friendly relationship between the two. Why your Pet must have a Bed of his own? Snuggling with our dogs can be comforting and most of us would not mind letting our furry babies curl up on our soft and comfy beds in the night and during the day. Pet owners still feel that a dog bed is not a necessity but a luxury that they can easily do without. This is far from the truth and our dogs like us deserve a bed of their own. A dog bed can benefit you and your pooch in many ways. Here are some of the reasons why you must consider getting your pooch a bed, if he does not have one already. According to a report in the journal “Emerging Infectious Diseases” out of the 250 known infectious diseases that can be transmitted between humans and animals; more than 100 are derived from domestic pets. The risk of your pet making you sick is relatively small though, and according to WebMD sleeping with a pet can be problematic only for those who suffer from pet allergies or asthma. However, there are other reasons why your doggie must not be sleeping on your bed. A study conducted by the Mayo Clinic Sleep Disorders Center found that about half the patients who complained of insomnia in the study had a dog or cat, and 53% of those pet owners said their pets disturbed their sleep in some way every night. Even if your dog is not disturbing your sleep, you could be upsetting his sleep unknowingly. By having your dog sleep in his own bed, you’ll ensure that both you and your pooch get a good sleep every day. Dogs tend to shed a lot in the places where they sleep. You’ll have a tough time cleaning your house, if you let your pet sleep on your bed or the couch in the living room. Dog beds, on the other hand, are easier to clean and maintain. Some beds even come with machine washable covers and cushions that allow for easy cleaning and washing. Dogs run, quiver, twist and turn in their sleep. By sleeping on his own bed, your pooch will have enough space to move around without getting hurt or hurting anyone else in the process. Keep your dog’s size in mind while you buy him a bed and always get a bed that is slightly larger than the space your dog occupies when he is curled up in a sleeping position. Your dog deserves a personal space of his own in the house and a dog bed would provide him with that. If you have two dogs in your house, then it necessary that both of them have separate beds that they can claim as their own and retreat to during the day, else they might end up fighting with each other over the bed. A good night’s sleep will keep your pooch healthy and happy. 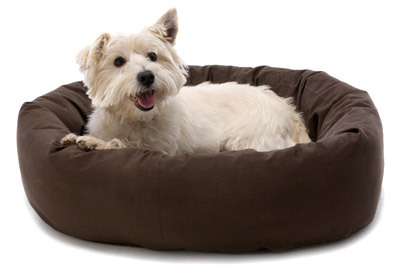 Made of soft cotton fabric and foam, dog beds offer firm support for your pooch’s back and limbs and prevent body pain. A good bed will contribute to your dog’s overall health. Check out Woofilicious’s collection of dog/cat beds here. You can also shop for dog blankets here.